Iguassu Falls: Amazing beauty of the unspoiled nature in the middle of jungle - The tour of the Parque National Iguacu. 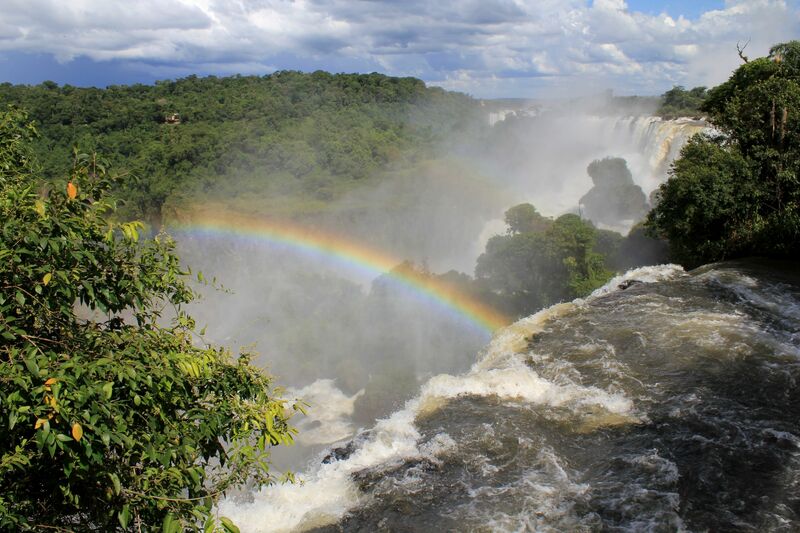 No question, the Iguazu Falls are the real gem within the Iguassu National Park, but the park has much more to offer. An example is the jeep-safari across the inaccessible for trekking wilderness of exuberant subtropical vegetation. Typically it is a 2 hours trip over the distance of about 12 km (7.5 miles) along the rain forest trail. The jeep often stops (also at you request) offering you possibility to take pictures or even to leave the car for short walks. The accompanying National Park Ranger helps you to spot birds, monkeys …. (you will be offered the binoculars) and provides professional comments regarding the rain forest and its rare species you will see on the way - including orchids and giant ferns. It is not possible to promise that you will see any particular animal during this safari trip. First of all - wild animals are not promoting themselves red-carpet Hollywood stars; they live their own lives. Secondly, many animals are nocturnal. There is a big chance however that you will see striking birds - easiest to spot thanks their vivid colors, coatis (local raccoons), lizards, countless butterflies (if this is their season), monkeys. I was lucky to see (and capture on the photos) a serpent. Rarely you will find more breathtaking vistas. They are like out of this world although you certainly realized throughout this site that all that really exist in the Parque Nacional Iguazu. 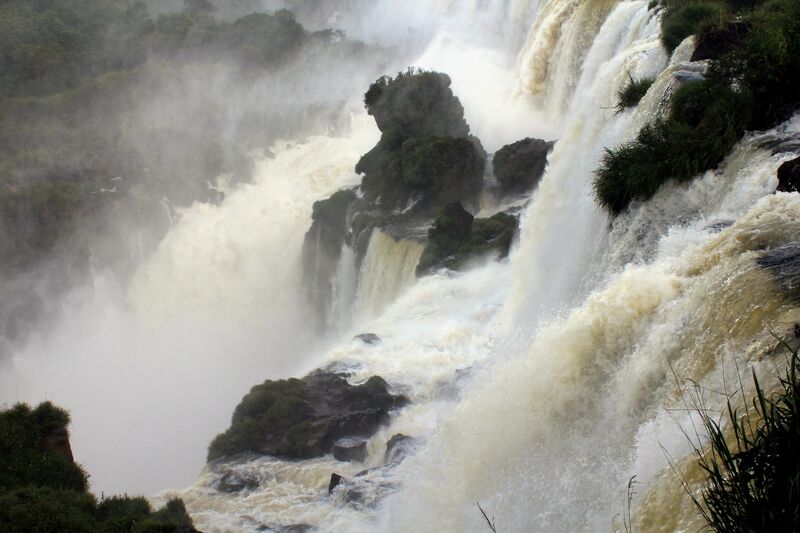 Dramatic views of the Iguacu waterfalls from the top of the cliffs in Argentina. Coexistence of Inferno and Paradise - all that in Parque National Iguazu. I heard people complaining about the tour in terms of “how much of wildlife” you can see. It is a “sound of silence” from otherwise full of life jungle giving you chance to “connect” with the nature. The bottom line is – the rain forest safari is not the Zoo park, so if that is what you expect then you are in the wrong place. The tour operator provides cold bottled water, umbrellas (showers are happening here!) and possibly an insect repellent (although for the best protection have your own). The is a relaxing ride on the already calm waters of the lower Iguazu River down to the Parana River. Do not expect much regardless advertisement of the tour operator. It is just a nice evening in the company of the life music show ending with the beautiful sunset on the river. It will be either deadly boring (especially after living the Iguassu Falls experience) or calming. The advertised Guarani Show on the banks of the river does not stand up to even lowest expectations (based on what I saw). To avoid disappointments please make-up your mind and decide what you want before buying the tickets. On the Brazilian side besides the vistas of Iguacu Falls cataracts (mainly close look at the Devil’s Throat) it is worth to visit the Foz Bird Park with several walk-in aviaries with a nice collection of birds and butterflies (see link below). Well, I hope that these Free Iguassu Falls Information Pictures as well as Iguazu Falls facts that you found throughout several pages of this website left you with beautiful memories and at least some photos (stored in your computers or may be even developed and sitting in your photo-albums). It was my pleasure to share with you my feelings, experiences, observations and of course - Pictures, a lot of them :-)!